Use the form below to contact accommodation Villa Umah Daun directly. 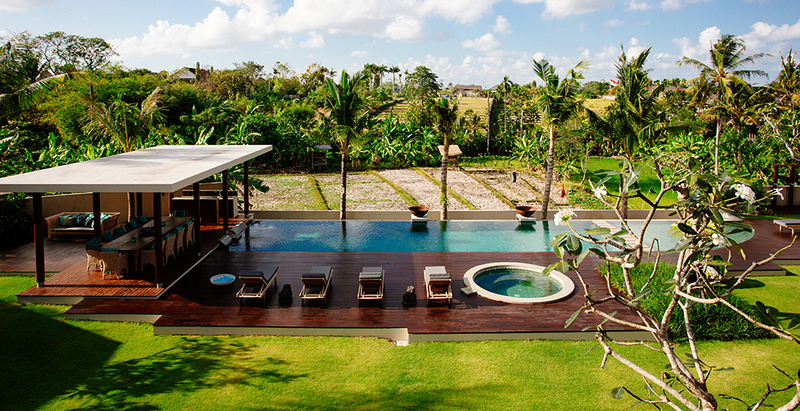 Umah Daun is an imposing five-bedroom villa presiding over rice fields just north of Umalas village in Bali’s popular Canggu district. 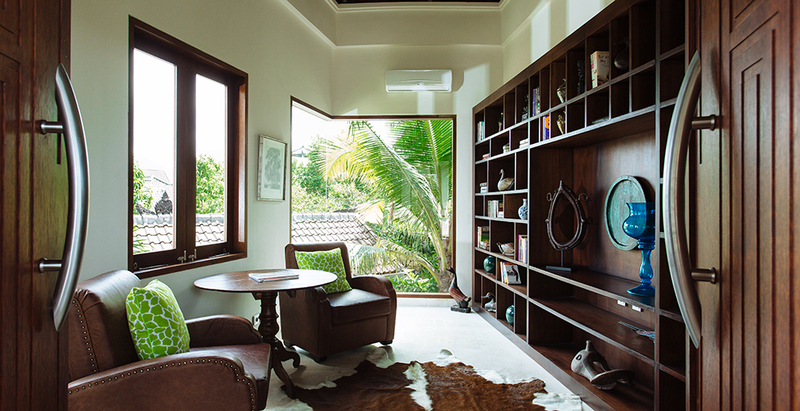 The villa’s super-sized rooms are spread across an interlinked series of pavilions capped with extraordinary leaf-shaped roofs – umah daun means leaf house in the Indonesian language. 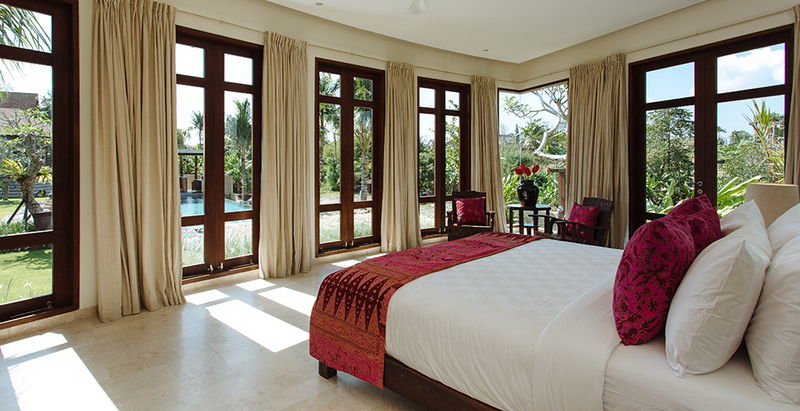 Acclaimed Bali architect Jeghier is behind the distinctive design aesthetic – exciting light-filled spaces that flow seamlessly towards the rice fields beyond curved walls of fully retractable bi-fold glass doors. Everything is over-sized for optimum sociability and comfort, from the double-height living room with two distinct seating areas to the huge dining table sculpted from a five-metre slab of solid wood, to the dining bale by the extra-long pool and the enormous sunset roof terrace. 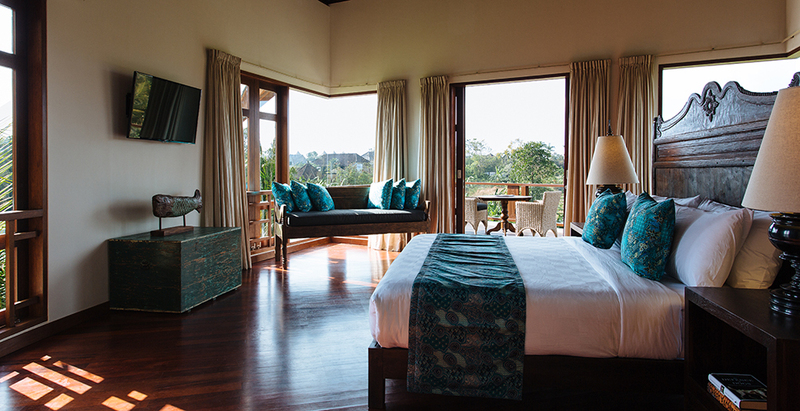 The five bedroom suites are equally generous in size, with supremely comfortable beds and large bathrooms. 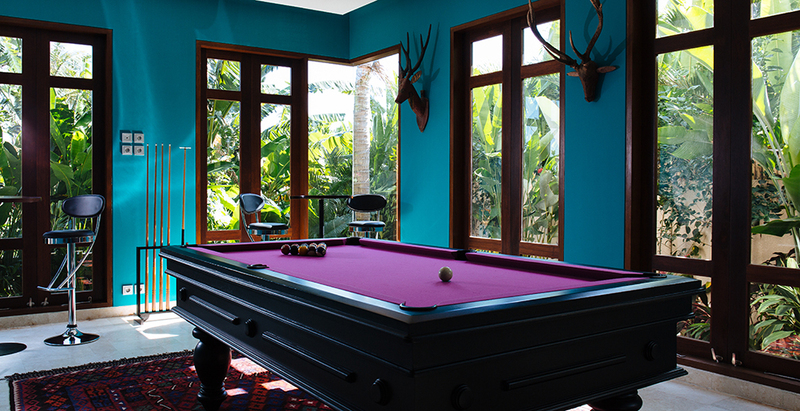 Umah Daun’s extensive facilities will keep guests busy all day; there’s a games room with pool table and table football, a media room with 60-inch TV, and a library. Kids are well catered for too, with their own playroom with TV, Nintendo Wii and games, a two-level tree house, and a large wading pool sectioned off from the main pool. Looking after all guests is the nine-strong staff, including an accomplished chef. 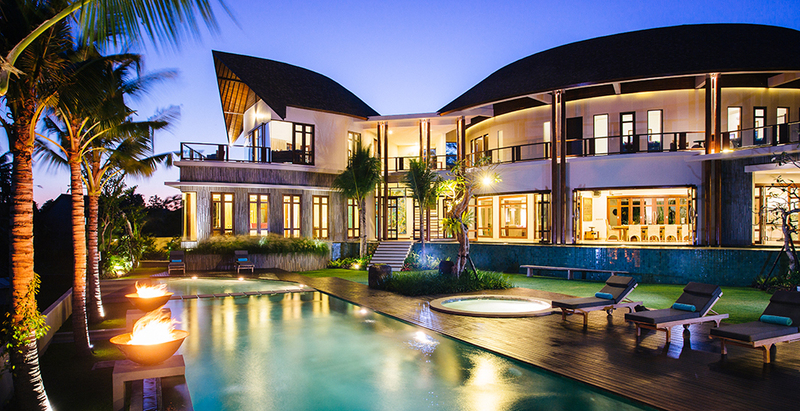 With its stunning design, uncompromising quality and excellent facilities, Umah Daun will appeal to families and groups of friends who appreciate the luxury of abundant indoor and outdoor spaces and entertainment options while relishing the proximity to Bali’s famed sunset beaches and Seminyak’s best restaurants, bars and boutiques a short taxi ride away. Overlooking an expanse of working rice fields, Umah Daun rests at the end of a cul-de-sac in a quiet Balinese residential area just north of the village of Umalas. 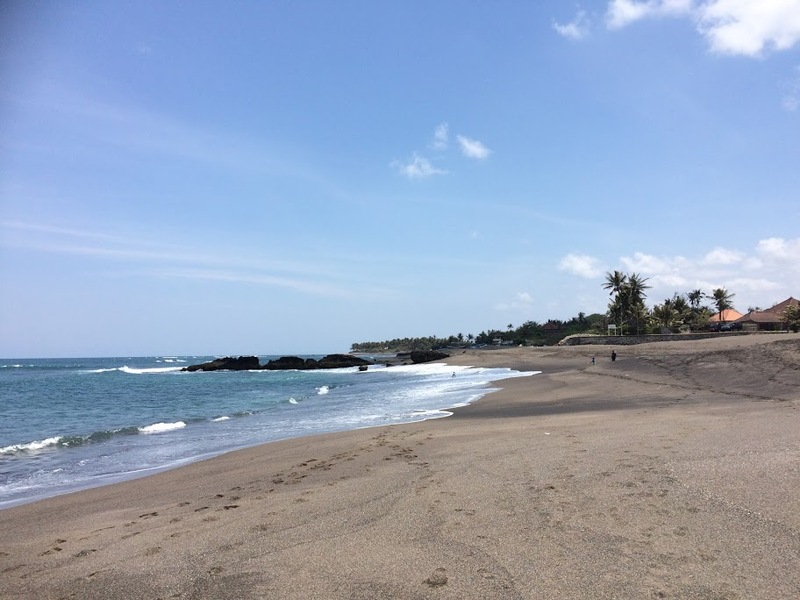 ATMs, a mini-mart, a bakery and a health food store are within walking distance, and it’s only a five-kilometre drive to Seminyak’s chic shops and restaurants, or seven to surfing hot-spot Berawa Beach. 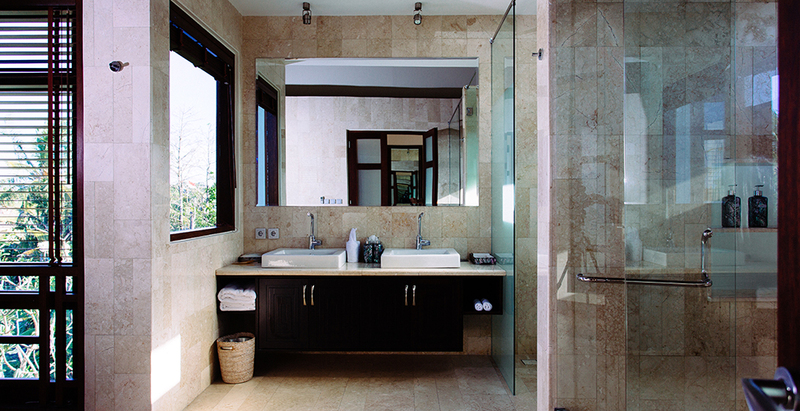 – Light-filled marble-lined bathrooms with walk-in showers and statement bathtubs (in three). LOCATION : Umalas village, Kerobokan, south-west Bali, Indonesia. CAPACITY : 10 guests (5 ensuite bedrooms: 2 with king-size beds, 3 with twins convertible to kings); 2 extra beds available (additional charge). 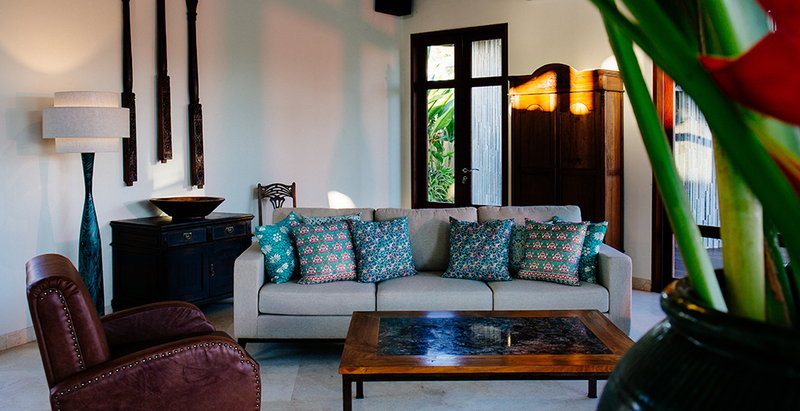 LIVING AREAS : Living room; open-sided dining room with table for 14; open-plan kitchen with wine room and service kitchen behind; media room; games room; poolside dining bale with table for 12; rooftop terrace. POOL : 15 x 4.5m main pool; 7 x 4.5 x 0.6m kids pool; jacuzzi. 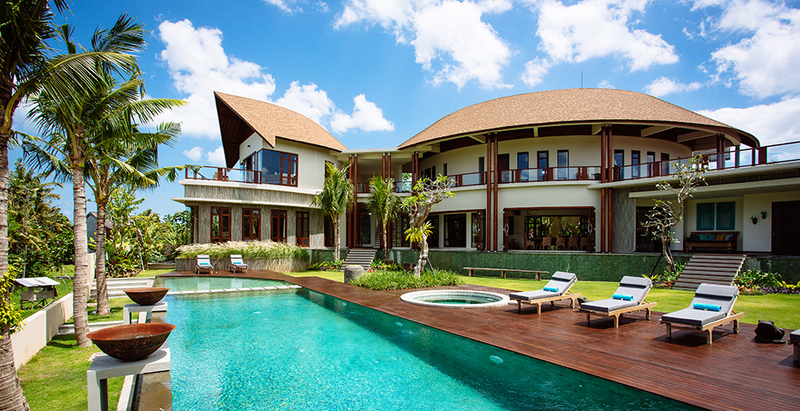 STAFF : Villa manager; chef; butlers; gardener; security. Other staff, eg spa therapists and babysitters, available on request (additional cost). DINING : An extensive suggestion menu of Balinese, Indonesian, western, children’s meals; special and dietary requests accommodated; dinner parties can be catered. COMMUNICATION : Telephones in all rooms; local calls included, international calls charged; wireless broadband internet access. ENTERTAINMENT : 60-inch satellite channel TV and DVD player in media room, 40-inch satellite TV and DVD player in games room, kids play room and master bedroom; Sonos WiFi sound system; pool table; table football. 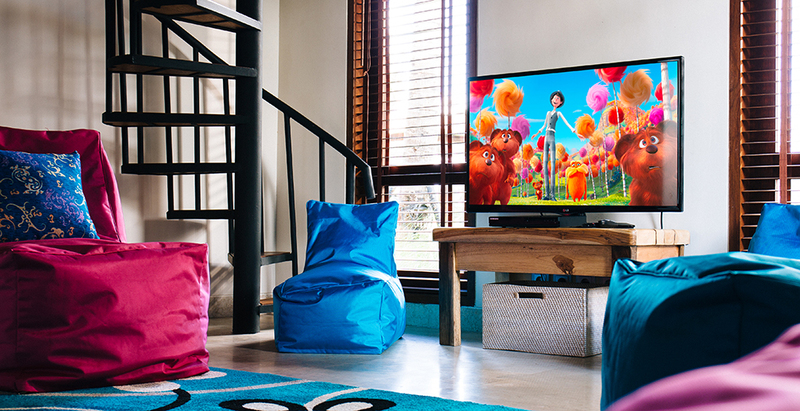 FOR FAMILIES : Play room with TV, DVD player and PS3; board games; tree house and pool inflatables. SPA : Treatments selected from a comprehensive spa menu can be carried out by professional beauty therapists in the privacy of the villa (extra costs apply). TRANSPORT : A car and driver is available to villa guests for 8 consecutive hours a day (excluding petrol), at a cost of US$25++. ADDITIONAL FACILITIES : Barbecue grill; in-room safes; generator back-up. PROPERTY AREA :1,300sqm (villa); 2,000sqm (land). 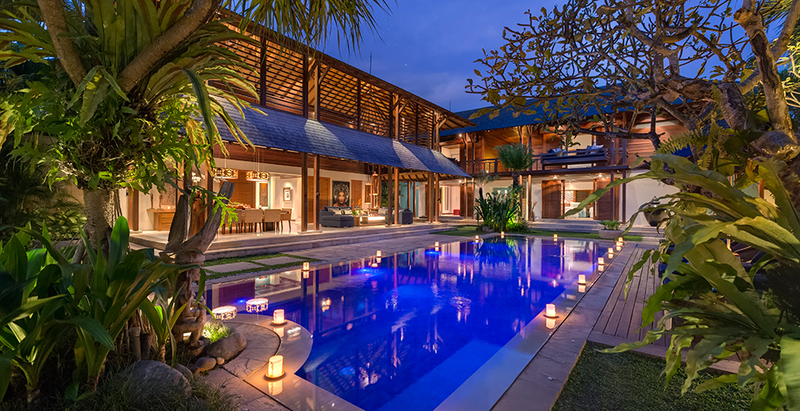 Enjoy the exclusive use of the whole villa, its private swimming pool and unlimited WiFi and the flawless service of its team of staff, including the villa manager, personal chef, well-trained cook, villa attendants, butlers and security. LOCATION : Umalas village, Kerobokan, south-west Bali, Indonesia. CAPACITY : 10 guests (5 ensuite bedrooms: 2 with king-size beds, 3 with twins convertible to kings); 2 extra beds available (additional charge). 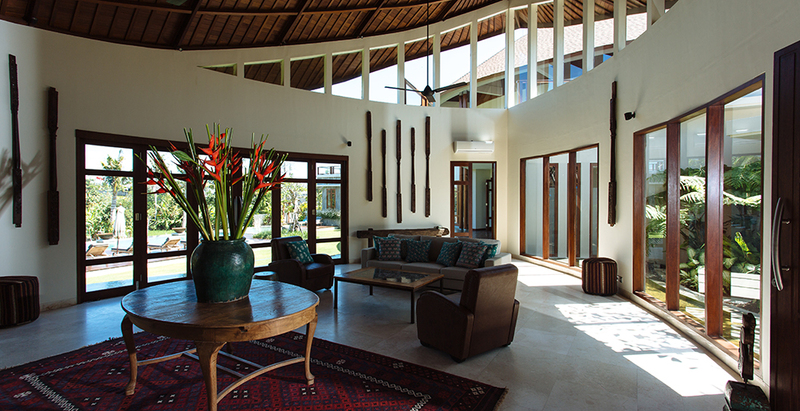 LIVING AREAS : Living room; open-sided dining room with table for 14; open-plan kitchen with wine room and service kitchen behind; media room; games room; poolside dining bale with table for 12; rooftop terrace. POOL : 15 x 4.5m main pool; 7 x 4.5 x 0.6m kids pool; jacuzzi. STAFF : Villa manager; chef; butlers; gardener; security. Other staff, eg spa therapists and babysitters, available on request (additional cost). 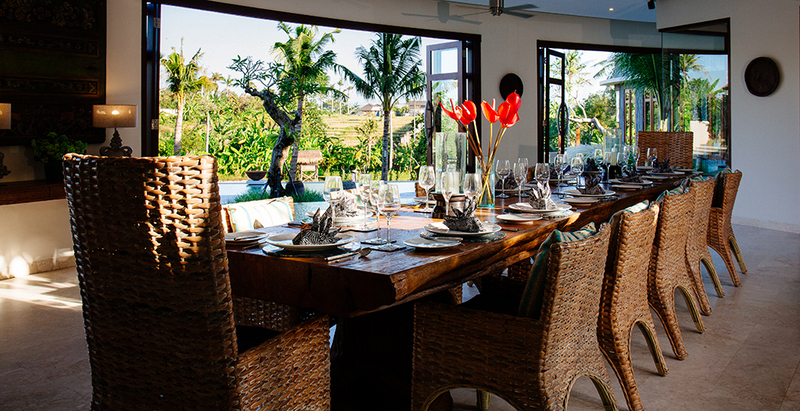 DINING : An extensive suggestion menu of Balinese, Indonesian, western, children’s meals; special and dietary requests accommodated; dinner parties can be catered. COMMUNICATION : Telephones in all rooms; local calls included, international calls charged; wireless broadband internet access. ENTERTAINMENT : 60-inch satellite channel TV and DVD player in media room, 40-inch satellite TV and DVD player in games room, kids play room and master bedroom; Sonos WiFi sound system; pool table; table football. 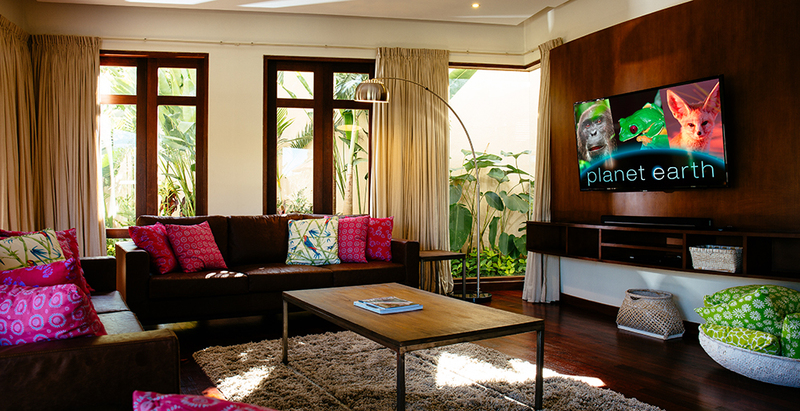 FOR FAMILIES : Play room with TV, DVD player and PS3; board games; tree house and pool inflatables. 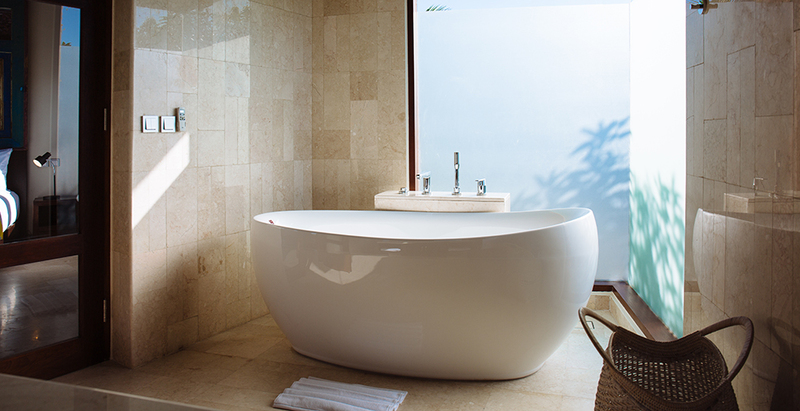 SPA : Treatments selected from a comprehensive spa menu can be carried out by professional beauty therapists in the privacy of the villa (extra costs apply). TRANSPORT : A car and driver is available to villa guests for 8 consecutive hours a day (excluding petrol), at a cost of US$25++. ADDITIONAL FACILITIES : Barbecue grill; in-room safes; generator back-up. PROPERTY AREA :1,300sqm (villa); 2,000sqm (land).